SINGAPORE - Great World City will be undergoing major enhancement works beginning mid-April, ahead of the opening of the Great World MRT Station along the upcoming Thomson-East Coast line in 2021. Under its first major refurbishment in 20 years, the mixed-use development in River Valley will add about 50 new tenants and three main access points to the MRT station. Visitors to Great World City can also expect a new design and facade as well as beefed-up food and beverage offerings, owner Allgreen Properties told The Straits Times on Tuesday (April 10). The works will be carried out over two years and are projected to be completed by the third quarter of 2020. The mall will remain open and accessible at all times during the enhancement work and major retail, dining and lifestyle tenants such as Zara, Golden Village, Best Denki, Cold Storage, Imperial Treasure Cantonese Cuisine, Kuriya Dining and Food Junction will be unaffected during the revamp, Allgreen said. But there will be some disruptions. 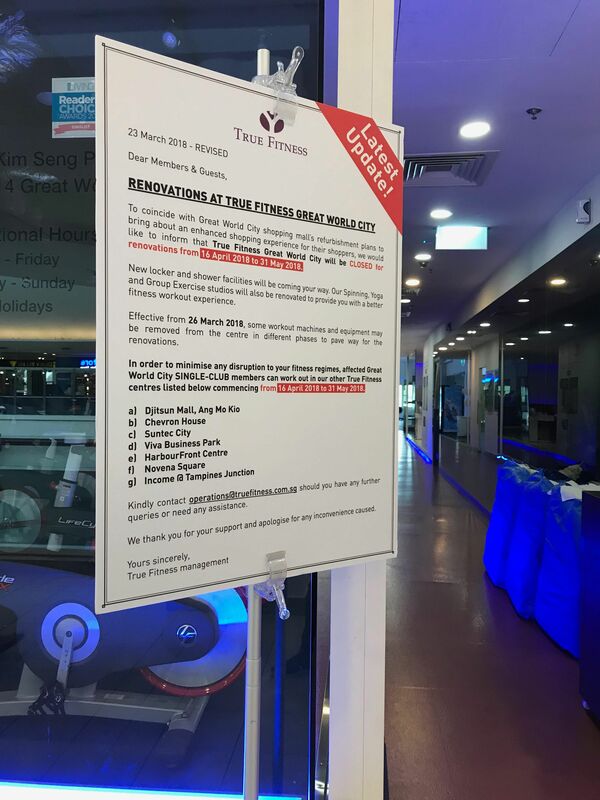 For instance, a sign posted outside True Fitness's Great World City gym outlet said it will be closed for renovations from April 16 to May 31 as part of the mall's refurbishment plans. 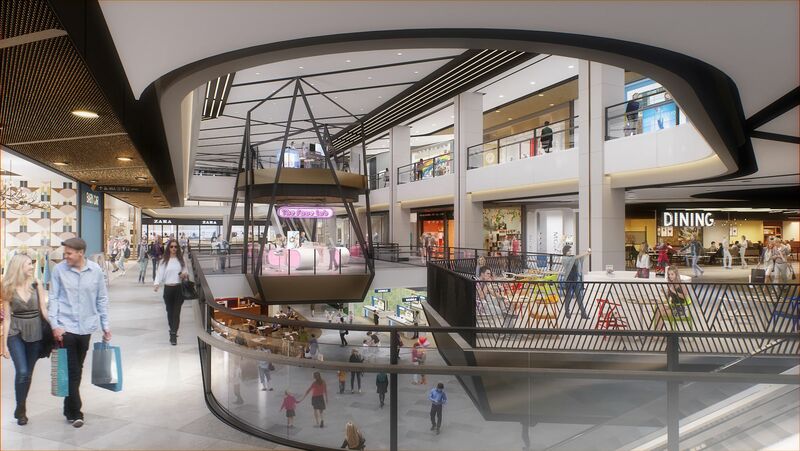 Allgreen said the mall's interior walkways and escalators will be reconfigured to ease navigation and improve accessibility, while "dual-level retail pods" will be created in the foyer, which will house creative retail concepts. The mall's F&B offerings will increase from the current 20 per cent to 30 per cent of net lettable space when works are completed. Level one will house a dedicated F&B zone, where tenants can trade for slightly longer hours over weekends and on the eve of public holidays. The foodcourt will take on a new dining concept when it is relocated from the basement to level three in the first quarter of 2019. Basement one will feature a new food hall concept alongside other retailers and F&B operators for a "marketplace experience", Allgreen said. The new tenant mix will also feature a cluster of Japanese-focused retail and F&B tenants to cater to the Japanese community living in the area. An outdoor playground will also be created near the existing pedestrian overhead bridge on level two. Allgreen Properties chief executive Lee Yew Kwung said: "With the revitalisation of Great World City, we are very excited to bring a newfound vibrancy to the River Valley area whilst maintaining its roots as a beloved leisure and lifestyle destination." Allgreen said the improvements will also create better connectivity for office tenants and shoppers. A new retail link in basement two will provide the public with access between the mall and the upcoming MRT station. Great World MRT station will be also be accessible from level one, and the pedestrian overhead bridge on level two. While office tenants currently have to take the lift to the level one office lobby before entering the mall, there are plans to directly connect the office lifts to level three of the mall.